If you are interested in filtering unhealthy chlorine and contaminants in your water as well as eliminating the negative effects of hard water without the use of salt then the low maintenance, easy-to-use Pelican Combo Series is your answer. Join the tens-of-thousands of satisfied customers and see for yourself why the Pelican Premium Combo Series is the "Ultimate Home Appliance" for your family.Stop buying expensive bottled water or lugging salt, and start getting better than bottled water quality from every tap in your home while saving you time and money. The Pelican Premium Combo Series combines the Carbon Series along with the NaturSoft Series to give you "A True Spa-like Experience". You will experience dramatic results from the very first shower. The first tank is the Carbon Series premium whole house water filtration system. This premium system is designed/developed to completely remove or significantly reduce chlorine, chloramines, VOC's, SOC's (synthetic organic chemicals), THM's, atrazine, benzene, pesticides, sediment and/or particulate matter, tastes, odors and hundreds of other potential contaminants that may be present in your water. This deluxe, high-capacity, virtually maintenance free system is easily installed in any home and has a 600,000.1,000,000 gal/5-year Performance Guarantee, the best value on any whole house water filtration system in America! A 5-micron pre-filter system is also included with each system to filter out dirt or debris from entering the home. The second tank is the NaturSoft Salt-Free Water Softener, the most environmentally conscious hard water softening/conditioning system available, Pelican's Proven and Certified technology that stops the negative effects of hard water without the use of salt or electricity. The Pelican NaturSoft system also actively removes any existing hard water scale formation in pipes and water heaters. All Pelican Combo systems come with a 5 micron pre-filter system that helps protect your new filter system and your home appliances from the damaging effects of sediment (dirt & debris) build up. The sediment in city or well water can clog faucets, damage appliances and even change the taste of your drinking water. The pre-filter system filters down to 20 times smaller than the diameter of a human hair or 5 microns in size. The Pelican combo series is the only maintenance-free system that is completely salt-free. Installing a whole house filter is not just about having better tasting water and softer hair and skin. It is also about saving money and time. Many people currently go out and buy bottled water thinking its cleaner and better for you then tap water. The truth that has recently come to light is the fact that 24% of bottled water is nothing more then filtered tap water. Some even contain sodium in them from using a salt-based water softener to "filter" the bottled water. Adding a whole house water filtration system from Pelican Water Technologies will save you thousands of dollars over the years. For as little as .09 cents a day you can have better tasting, filtered water from every tap in your house. No more plastic water bottles in our land fills and no more flushing your money down the toilet! The most important investment you make in your home are your appliances. Why not protect those investments from the damaging effects of hard water and save money on costly repairs! Repairs can cost you hundreds of dollars every year due to hard water damage. Protecting your appliances will keep them running longer and more efficient without needless repair costs. To repair your ice maker in the fridge from hard water damage costs $230 for a repairman! A hot water heater, if protected can save you up to $30 a month in water heating by keeping scale buildup off the heating element, making it more efficient. Not protecting your water heater could cost you $300-$1,000 to replace! You also save the yearly plumber visits for clogged shower heads, minor appliance repairs or clogged pipes which will save you up to $500/ year! 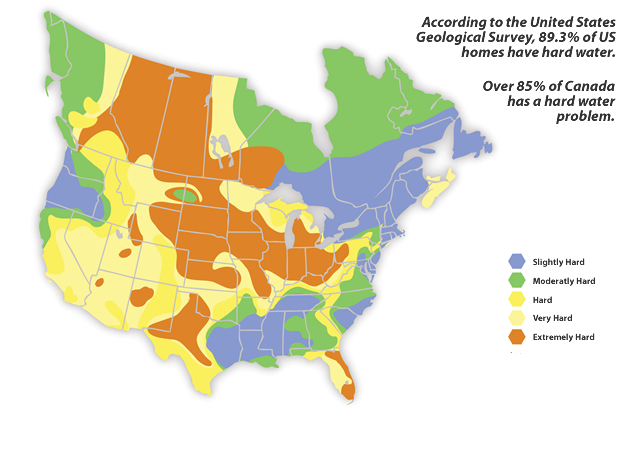 Hard Water Map. Martha Stewart and Body + Soul Magazine are world renowned experts on healthy living. This is why we were not surprised that they featured the Pelican PC600 Whole House Water Filter as their recommended product. Pelican was asked to be a part of this Green Home, featuring our Pelican Combo Series for their water filtration and softening needs. The Go Green Home is a 4,300 square foot living laboratory of green design, materials and innovation. They are "deconstructing" an existing single-family home -- taking it apart board by board, nail by nail. Usable building products are donated and recycled, diverting material from the landfills. We're studying the sun, the winds and the neighborhood, and they are incorporating everything into the design and build of their new home. Plus they are greening it all -- from solar roof panels to recycled content countertops in the cutting edge cook's kitchen. They will take you with them, step by step, updating frequently with journal entries and photos of their progress. The Pelican Carbon Series Premium Whole House Water Filter utilizes the highest grade carbons available on the market which were designed/developed to completely remove or significantly reduce chlorine, chloramines, VOC's, SOC's (synthetic organic chemicals), THM's, atrazine, benzene, pesticides, sediment and/or particulate matter, tastes, odors and hundreds of potential contaminants and harmful chemicals from the water supply entering your home. View list of additional contaminants addressed. The Pelican Carbon Series uses a granular activated carbon produced from coconut shell by a high temperature activation process under stringent quality control. It has a large surface area, high mechanical hardness, high pore volume and chemical stability. This product is NSF Certified and meets or exceeds all food chemical codex, AWWA and ASTM Protocols. In addition the Pelican Carbon Series utilizes Non-chemically impregnated activated carbon. It has been surface modified during manufacturing, to significantly enhance the carbons' capabilities for rapidly decomposing noxious compounds. The carbon media used also has a much higher surface area than most other competitive brands on the market. This enables them to reduce larger quantities of other organic species which may be present in your water. The Pelican Carbon Series Whole House Water Filter Systems are specially designed as an Up-Flow System that does not require any special process or instructions for replacing the media. Other Down-Flow Systems on the market do not allow for the media replacement as an option because the homeowner would have to have special knowledge or tools to complete the task. Many water filtration experts agree that down-flow systems often have channeling issues in the media making them less effective in filtering out contaminants in the water because the water is unable to reach the unexpired media. It is important to understand how the carbon media inside the Pelican Carbon Series Systems works; Adsorption: the process by which matter (contaminants) adheres to the surface areas of a solid adsorbent material (carbon media). In layman's terms the contaminants in your water are absorbed into the carbon media on contact. The carbon media does not release any contaminants back into your water once they are absorbed. We offer the replacement media as a more cost effective and environmentally friendly approach. When it comes time to replace the media, you are not throwing away a tank, fittings, or having to try and dispose of a complete system. Not to mention the cost of hiring a plumber to remove the old tank and install the new one. Some companies are trying to discourage this process and use tactics to scare the consumer in to thinking that they must buy a completely new system when the media expires; this is unnecessary and not very cost effective. The media is the fuel for the system (it.s like the gas in your car). If you had to replace your car every time you ran out of gas that would be crazy, the same goes for the filtration system. The tanks and fittings are designed for this specific application. The cost of the system does not only include the media inside the tank, it includes many factors: the tank, fittings, media, and labor to build, shipping, advertising, and overhead. The media inside the tank is only part of the cost of a complete system therefore you can not rate the effectiveness of the media based on the low cost to replace it. The Pelican Combo Series Systems use an up-flow design and do not waste any water while filtering and softening/conditioning the water for your entire home. While other systems use a down-flow design requiring them to backwash once or twice a week wasting 100-300 gallons of water each time they backwash. The fact is that we can not afford to waste one drop of water. Water is one the most important resources we have on earth. The Pelican Combo Series Systems eliminate the need for an electronic head for backwashing because of its up-flow design. No moving parts means less maintenance and no service calls for damaged moving parts that render the system unable to filter your water.